Christmas is a lovely time of year. Although sometimes our expectations of it can be too high, and it fails to live up to the hype. For those who are only looking in on Christmas, not celebrating it, Christmases exist first and foremost in storybooks and in the imagination. My idealised version is born from a lifetime of reading about great Christmases. Last Christmas I blogged about The Holly and the Ivy, my favourite Christmas story for younger readers. But when I was slightly older, it was Louisa May Alcott’s Little Women that clinched the deal, and persuaded me that, despite being a Londoner, real Christmas was in the snowy suburbia of Massachusetts. And immediately the scene is set, and one of my favourite characters begins to take shape. 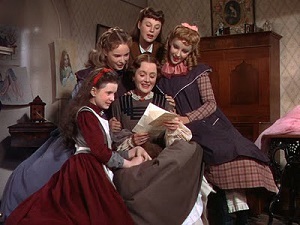 That first Christmas in Little Women, with its “four young faces on which the firelight shone” paints a dampened Christmas, with ‘relative’ poverty, from which the girls start to learn valuable life lessons, such as sacrifice, generosity and charity. They are rewarded for their virtues by a neighbour with “distracting French bonbons” among other things. But Christmas means more when it comes as a pause in working – and the work ethic theme runs throughout the novel. That the girls and their mother find meaning through labour, resonates with the Puritan teachings of New England where Alcott grew up. So the holiday of Christmas, when it comes, is even more joyful because of its juxtaposition with the rest of their year. 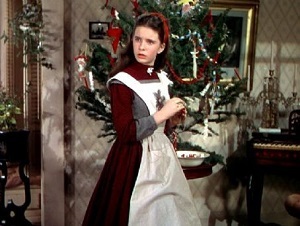 But it’s the Christmas with which Part One ends that competes with all the cheery Christmas films on TV, with its excess of delights, and a homecoming to rival The Railway Children. They do have a sumptuous Christmas meal that year, in stark contrast to the beginning of the book in which they sacrificed their breakfast pancakes and muffins for the poor family down the road. Little Women may be an old classic, but it pushes the boundaries with its challenge to gender stereotyping, and the values it espouses. Moreover, to make modern day authors feel perfectly sick, Alcott apparently only started writing Little Women in May 1868, and the book was published in September (just four months later). You can buy it here. Have a lovely bookish Christmas.